Heeguen Song performs actively in the Bay Area and Seoul, Korea as a member of Beaubliss Quartet, Ensemble Ari, Sonnet Ensemble, Oakland Symphony, Berkeley Symphony, Santa Rosa Symphony, and Symphony Silicon Valley. Ms. Song was a prizewinner at the Henryk Szerying International Violin Competition in Mexico. She has also won the first prize at the Kingsville International Competition and was a prizewinner at the Irving M Klein International Competition. San Francisco Bay Area native, Pianist Sharon Lee Kim is an active chamber musician, director, vocal coach, and instructor. She is a frequent recitalist and has performed and recorded throughout the nation and internationally. Hee-Guen Song, violinist, has performed in Asia, South America, Canada, and the US, including prestigious venues such as Alice Tully Hall at the Lincoln Center and Weill Recital Hall at Carnegie Hall. 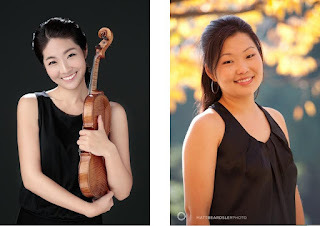 Ms. Song has appeared as a soloist with Oberlin Orchestra, Nova Vista Symphony Orchestra, Rutgers Symphony Orchestra, Ensemble 212 and Camerata Academica de Merida among others. As an active chamber musician, Ms. Song has performed at the Chamber Music Society at Yale and has appeared at numerous chamber music festivals including Yellow Barn Music Festival, Taos Music Festival, and Banff Arts Festival Chamber Music Residency. A native of Korea, Ms. Song has studied at Oberlin Conservatory, the Juilliard School, Yale School of Music and Rutgers University. Ms Song resides in Albany with her husband and two children. San Francisco Bay Area native, Pianist Sharon Lee Kim is an active chamber musician, director, vocal coach, and instructor. She is a frequent recitalist and has performed and recorded throughout the nation and internationally. Ms. Kim joined the Saint Mary’s College Music Faculty in the fall of 2008. She is the Assistant Director and Accompanist of the internationally award-winning Saint Mary’s College Choirs, and is a Lecturer in music history and keyboard harmony. Aside from teaching at the college, Sharon is the co-founding member of Duo Camaraderie together with flutist Laura Scarlata, staff pianist at the SF Conservatory of Music, instructor at the Crowden Music Center, and pianist at the SF Girls Chorus. Sharon maintains a thriving private studio, teaching piano and vocal coaching singers. Sharon holds degrees from UC Berkeley (BA) and New England Conservatory (MM and GD). Her primary teachers were Irma Vallecillo, Kayo Iwama, John Greer, Barbara Shearer, and Margret Elson.